While many causes of cancer are environmental—what we inhale voluntarily (e.g., tobacco smoke) and involuntarily (hazardous chemicals), and even excessive sun exposure—what we eat or don’t eat can also play a significant role. Nothing in our diets can prevent or cure cancer single-handedly, but researchers are high on these foods for their cancer-protective properties. So eat up! 1. Cruciferous vegetables: The kin to the mustard or cabbage family—cabbage, broccoli, kale, brussels sprouts and collards—are all great sources of anti-cancer properties such as the compounds diindolylmethane and sulforaphane and the element selenium. But here’s the twist: The punch comes with the crunch. The more you chew, the better it is for you, since, in order for these chemicals to be properly released, the veggies need to be fully broken down. 2. Wine: Because of its high concentration of the chemical resveratrol from the grape skin, a stemmed glass of vino—red wine in particular—is not only anti-cancer but pro-heart. Before you fill your glass to the rim, however, know that moderation is key. Overconsumption of alcohol can be associated with liver, breast and stomach cancers. So find the balance, sis. Let’s say … one glass a day. 3. Walnuts: Get crackin’, lady. Walnuts contain many helpful nutrients and healthy omega-3 fatty acids, which help your body fight inflammation. Research also suggests that walnuts may actually slow the growth of breast-cancer tumors. Therefore, this nut could play a role in breast-cancer management even after diagnosis. 4. Ginger and turmeric: Curry dishes on deck! Ginger has powerful anti-inflammatory properties and can slow cancer growth, while turmeric, the spice that forms the base of most curries, is from a root in the ginger family. The active ingredient curcumin may play a role in helping to stop the growth of breast-cancer cells when combined with certain drug-based therapies. Plus, it may also have an anti-inflammatory effect that could protect your overall health. 5. Flaxseed: Ground flaxseed, more potent than its popular oil-based form, includes a component called lignans, which may actually reduce cancer-cell growth (pdf). You can buy ground flaxseed or grind the seeds yourself using a coffee grinder. Then sprinkle the ground flaxseed on salads, mix in smoothies or even bake in muffins. 6. Green tea: Green tea and white tea both contain catechins—extracts that seem to show some breast-cancer-prevention benefit. Research suggests that green tea is also particularly effective at protecting your cells against environmental exposures that may increase your risk of developing cancer. You’re going to have to down a lot of tea (think 4 or more cups a day), however, to achieve this effect. P.S. : Sugary green-tea drinks don’t count. 7. Fish: Looking for a great alternative to red meat that is packed with vitamin D and omega-3 fatty acids? Fish oil and straight fish are your best bet when it comes to cancer prevention. Fish is also a smart lean-protein source. So opt for salmon, mackerel, sardines and sea bass as cancer-preventive diet choices. 8. Chocolate: Yes, chocolate (in moderation) can be healthy—provided that the cocoa-to-candy ratio remains high. So when cravings creep in, reach for a dark-chocolate bar with at least 70 percent cocoa (often spelled cacao). The closer to its bitter-bean state, the better. There is a class of chemicals in cocoa called catechins (also found in tea) that seem to offer protection against heart disease, stroke and, you guessed it, cancer. 9. Berries: If you see the word “berry,” then go for it. Strawberries, raspberries, blueberries and blackberries are extremely healthy and power-packed with vitamins, minerals and antioxidants that can aid in cancer prevention. 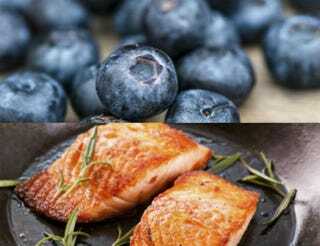 Most berries contain ellagic acid and other polyphenol antioxidants that inhibit tumor growth, but recent research suggests that blueberries in particular play a significant role in breast-cancer management by enhancing the effect of the often prescribed drug tamoxifen (used primarily to fight off breast-cancer cells).